After two months of writing, walking and (I won’t lie) luxuriating in Geneva, March will bring me back to London. 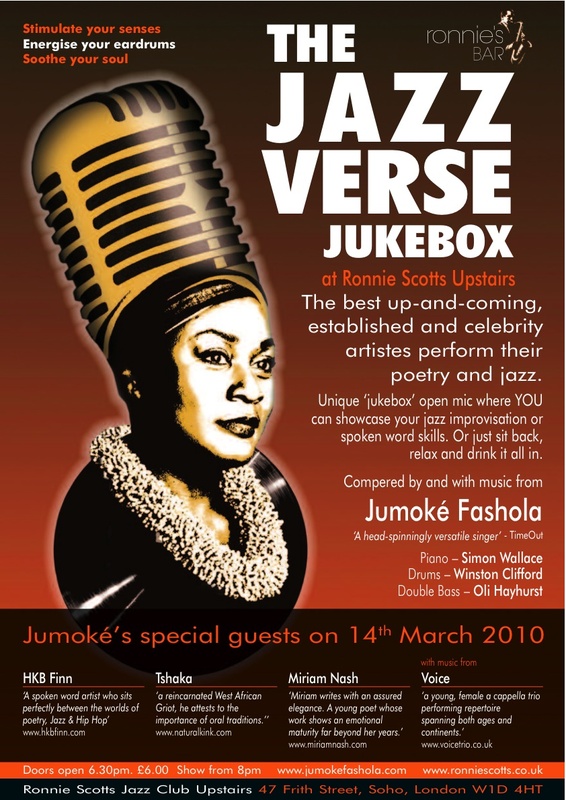 On Sunday 14 March, I’ll be performing at Jazz Verse Jukebox, Jumoké Fashola‘s poetry and jazz night at none other than Ronnie Scott’s Jazz Club. Jumoké is an award winning broadcaster and singer, and a truly inspiring lady. HKB Finn, Tshaka and Voice will also be featured, as well as Jumoké’s own band. It promises to be a great night. Jazz Verse Jukebox starts at 8pm on Sunday 14 March. If you’re a jazz performer or poet, you can enter the ‘jukebox’ for a chance to perform. Tickets are available on the door and it’s only £6. This entry was posted in Performances and tagged HKB Finn, Jumoké Fashola, Miriam Nash, Poetry by Miriam Nash, Ronnie Scott's Jazz Club, Tshaka, Voice. Bookmark the permalink. great to meet you yesterday.